Freeman has maintained an enduring interest in the performing arts and the visual arts. His practise as an artist has included performer, composer, draughtsman, printmaker, and sculptor. He has also dabbled in writing (unpublished) novels and poetry. his virtuosic flexatone solo in the Khachaturian Piano Concerto with the Cambridge University Musical Society. playing the automobile horns in Gershwin’s An American In Paris with the Whitehall Orchestra at the Barbican. cracking the whip in Bozza’s Trumpet Concerto, with the Sydney University Symphony Orchestra in the University’s Great Hall. wonderful memories ensconced behind the timpani in works by Sibelius, Mozart, Schubert, Barber, and many other great composers. At the University of Sydney, he was a member of the University’s gamelan. He also spent some time with his lips pursed around an oboe reed to no particular avail. And Then the Lighting of the Lamps for wind quintet and percussion – won second prize for composition in the North Queensland Concerto Competition (the title being drawn from the last line of T. S. Eliot’s ‘Preludes’). Bangalore Principles for the National Carillon, Canberra – written for the National Carillon which is across Lake Burley Griffin from the High Court in Canberra (the title being drawn from a speech Justice Kirby gave about the Bangalore Principle in international law). Sun’s Fleeting Days for string quartet – composed for the wedding of Freeman’s friends, Julian Leeser and Joanna Davidson, at the State Library of New South Wales (the title being taken from Ecclesiastes, 12.12). Sun’s Fleeting Days concert overture for chamber orchestra – a revised version of the string quartet. Ho, Ho, I Am the Toad for voice and piano – an arrangement of which was performed at the Garrick Club in London (a setting of Mr Toad’s Song from The Wind in the Willows). French Allemande for marimba and piano – a virtuosic work for solo marimba that explores gamelan music (the title being a play on the musical term, ‘allemande’, which is French for ‘German’). D’varim l’David for SATB choir – an a cappella setting of three Hebrew texts by the biblical King David (his lament, thanksgiving, and final words; the title means ‘Words of David’). Hava Nagila for percussion instruments – a gamelan-style arrangement of the traditional Hebrew folksong. I Heard a Fly Buzz When I Died for four unaccompanied voices – a setting of the poem by Emily Dickinson. Ariel’s Song for four voices with instrumental accompaniment – a setting of the song from Act ?, scene ?? of Shakespeare’s The Tempest. Piano for voice and piano – a setting of D. H. Lawrence’s poem, and dedicated to the composer’s high school music teacher, Mrs Witton. As a draughtsman, he has a particular interest in figurative art, and has experimented with mixed media on paper. To see a portfolio of his work, click here. 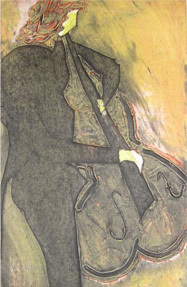 As a printmaker, he has experimented with etching, aquatint and other forms of printmaking. To see a portfolio of his work, click here. He also has some experience with mixed media sculpture, one of which was exhibited at the Art Express exhibition at the Art Gallery of New South Wales in 1995. To see an extract from the catalogue, click here. To see a photograph of a more recent experiment with carving, click here. As a schoolboy, he also dabbled with making wearable art out of gum leaves. For a photograph of him wearing his work, click here.